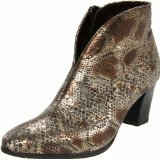 Sharp and stylish this Snake skin bootie will be a “must” for your wardrobe. Great with pants and jeans. For over 50 years, Ara has been providing its customers with footwear that is both comfortable and stylish. This commitment to fashion, fitting, and quality has allowed Ara to become one of Europe’s greatest producers of women’s footwear. With factories and offices in 6 countries, Ara is able to draw from a multitude of creative sources to deliver products that are on the leading edge of fashion and comfort. Using only the finest materials, each product is manufactured paying the utmost attention to detail and quality. Ara designs each shoe to cushion the foot’s complex anatomical structure. Ara also offers patented Goretex® technology in selected styles for increased breathability in the summer or warmth and moisture-proofing in the winter. From leather to suede, from boots to flats you are sure to find something that will give that special touch to your wardrobe. Whether you are heading to work or out for a night on the town, Ara’s wide range of styles will not disappoint. The best part, your feet will not only look great adorned in Ara footwear, they will feel great as well.